If you’re “seasoned” enough, you probably remember a time when adventure games were at the apex of their popularity, and LucasArts wasn’t yet too busy churning out bad Star Wars titles to bring us releases like Full Throttle, The Dig, and the Monkey Island franchise. 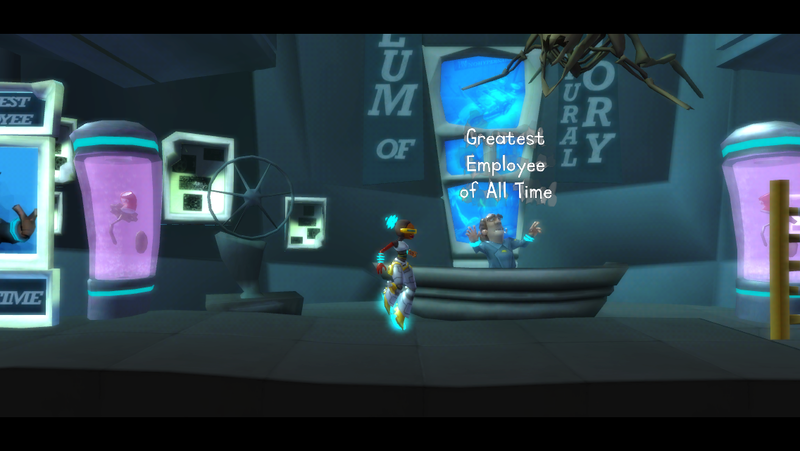 The Cave (App Store Link), a $5 title developed by Double Fine Productions and published by Sega, harkens all the way back to those glory days, and indeed counts LucasArts alumni Ron Gilbert and Tim Schafer among its creators. In this game, your task is to lead a group of three characters through the titular cave, a mysterious, sentient place that knows all of mankind’s history, from prehistory to the far future. You get to pick your alter egos from a pool of seven possible candidates, which include stereotypical gaming fodder like adventurers, knights, scientists, time travellers, and a particularly creepy set of twins. 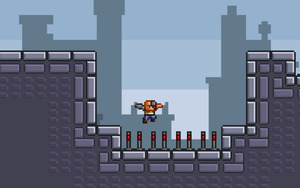 Each character possesses a unique special ability; for example, the Time Traveler can phase-shift through some solid objects like walls and gates, while the twins, which normally count as one character, can be temporarily split and controlled separately. The abilities come in handy at various point during gameplay; while you can complete the game with any set of three characters, certain areas can only be accessed if a particular character is in your party—which also means that, in order to experience every nook and cranny of the cave, you will need to play the game at least three times. 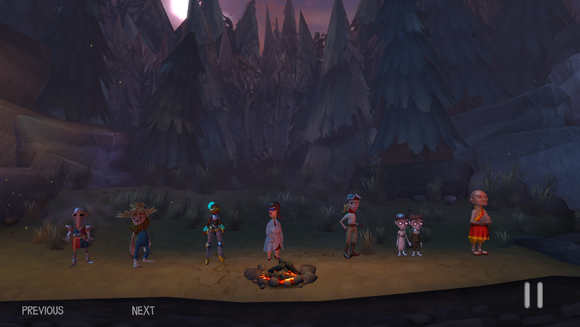 The Cave's cast of characters: from left to right, knight, hillbilly, time traveler, scientist, adventurer, twins, and monk. As is the case with any game in this genre, The Cave’s focal point is its script, which displays all the brilliance and ingenuity that made LucasArts’ old titles so popular. The titular cave is presented as an attraction of sorts, in which characters can explore the dark side of their personality without fear or repercussion; during their tour, they will have plenty of opportunities to die by just about any way possible: electrocution, fire, fall, laser, and digestion by creatures real and imaginary; in every case, however, they will respawn nearby, giving you another chance to regroup and plan your next move. At each step, you have to contend with devilish and often absurdist puzzle that often require the cooperation of multiple characters to solve. As a result of the game’s premise, these puzzles can almost always be solved in a way that goes completely (and usually hilariously) against each character’s stereotypical behavior: the knight retrieves a jewel by getting the fair damsel eaten by a dragon instead of saving her, the time traveler can only advance by altering the course of history, and so on. You even get the chance to dispatch a particularly obnoxious museum clerk by crushing his wheel-inventing ancestor with a boulder. To make things even more ingenious, the game’s script is peppered with references to classics of the adventure genre and a wide range of very clever little touches, like a damsel who is unwillingly in distress and would rather just pursue her dream of becoming a software engineer, or a future in which keys are looked upon as a curious archeological artifact whose function is lost in the mists of time. I didn’t find the puzzles too hard—after all, they are what makes an adventure game fun—but I did find grasping the game’s dynamics a bit too challenging at the beginning. The Cave throws you right into the thick of things, without any sort of tutorial level that gives you a chance to get acquainted with the way things work. The game is filled with witty dialogue and more than one way to explore your dark side—such as getting rid of a particularly obnoxious museum clerk by dispatching his prehistorical ancestors. The Cave’s takes place in a three-dimensional environment that you navigate as if it were a 2-D platformer. The game’s graphics are well executed, as are the soundtrack and, in particular, the voiceovers, in which the cave itself provides narration that punctuates your advancement in the game. The characters are rendered using a slightly exaggerated, marionette-like look that helps better highlight their personality even though they have no recognizable facial expressions and only communicate in grunts. Unfortunately, the controls are very hard to use, particularly on an iPhone, where the combination of small targets and an extremely finicky touch interface are enough to drive even the most patient player to distraction. While this is a relatively small issue—and one that I hope the developers will address in a future release—it makes the game much harder to play than it should be, greatly affecting its enjoyment. Still, as far as games go, The Cave is as good as any old-school adventure game that I can think of, with wit, tough challenges, and great jokes to spare. Once you get past the challenging controls, it's a fun game that will give your brain a workout while keeping you entertained for hours on end.